With America’s decade-long entanglement in Afghanistan coming to a close, the debate over the size and scale of any remaining American involvement in the country has come to the forefront of Washington’s policymaking circuit. From the Department of Defense and the State Department, to USAID and the White House, discussions are being held over not only how many U.S. troops should remain in the country after the withdrawal deadline of the end of 2014, but also on the potential abilities and effects that a force would have—especially regarding the potential of the U.S. retaining no troops in the country, the so called “Zero Option.” Afghanistan, Pakistan, the U.S., and to a lesser degree India and China, are all involved or carefully watching the debates, as vital national interests would be altered, depending on the U.S. commitment after 2014. But the one country that is watching the debates as closely as Afghanistan and Pakistan is Russia; not only because of its own history of intervention in the country, but because of the potential for instability to spill over into the Central Asian republics. Russia watched first-hand as Afghanistan descended into chaos and anarchy following its withdrawal in February 1989, enacting its own “Zero Option.” The slow decay of Afghanistan’s institutions and ruling mechanisms led to not only the eventual takeover of the country by the Taliban, but the growth in drug production and the spread of radical Islamist ideologies to Central Asia—particularly Tajikistan, which waged a civil war throughout most of the 1990s. To prevent the spread of instability, Russia had to support not only the economies and political structures of many of the Central Asian states, but contribute significant military support as well. Tajikistan, one of the poorest countries in the region, whose own military numbers some paltry 16,300 troops, has relied on Russia’s 201st Motor Rifle Division to help maintain security, especially in securing its 1,344-kilometer border with Afghanistan, since the fall of the Soviet Union. And due to the fear of a spillover of violence following the pullout of foreign troops, Putin and Tajik President Emomali Rahmon recently announced that they had reached an agreement extending the presence of the 201st through 2042, and a $200 million support package for the diminutive Tajik military. Russia is also helping to build up Kyrgyzstan, another desperately poor country, which is set to receive a $1 billion support package to help modernize its military. Steps such as these are aimed at preventing the spread of chaos that Russia witnessed following its own withdrawal. 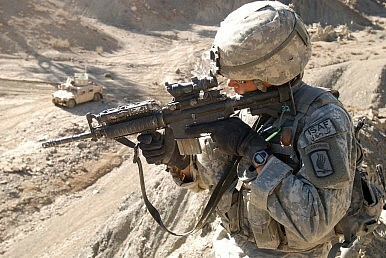 The fear is that Afghanistan’s institutions, both political and military, will be unable to operate without significant U.S. and ISAF support. Putin has urged the Collective Security Treaty Organization (the CSTO is a collection of post-Soviet states: Russia, Armenia, Belarus, Kazakhstan, Kyrgyzstan, Tajikistan and Uzbekistan) to create “An effective algorithm of practical action … to minimize possible risks for our countries” following the departure of foreign troops from Afghanistan. Further, Russia worries about the spread of terrorism and the return of militants who have received training in Afghanistan. The return of Afghanistan as a safe haven for terrorists to train and organize would threaten not only the west but Russia itself, who has been waging a campaign against an Islamic insurgency in the North Caucasus over the last two decades. Illustrating the threat is the fact that Russia recently foiled a plot by three Russian citizens who had received training in Afghanistan and were planning an attack in Moscow. But beyond the spread of regional instability and terrorism is the threat of drug trafficking. With Afghanistan supplying some 90% of the world’s opium, Russia and the Central Asian republics have become a key export route. The United Nations Office on Drugs and Crime notes that some 95 tons of heroin is trafficked through the “Northern Route,” incorporating Tajikistan and Kyrgyzstan, and to a lesser extent Uzbekistan and Turkmenistan, to its destinations in Russia and Europe. This has led to Russia consuming an estimated 70 tons of heroin, worth $13 billion, creating an estimated 2-3 million heroin addicts and leading to 30,000 heroin linked deaths every year. With much of Russia’s attention focused on the upcoming Sochi Olympics and its renewed interest in the Russian Far East and Pacific, the increasing realization that Russia will be forced to devote significant effort into Afghanistan is an unwelcome one. Russia fears the anarchy that would follow a total withdrawal and is determined to increase the political costs of doing so. Andrew S. Bowen is an editorial assistant for The Interpreter, a Russian language translation and analysis journal where this article originally appeared, and a member of the strategic-consulting firm Wikistrat.